I was visiting the oldest temple in Nepal, the Changu Narayn Temple where some amazing wood cravings and brass work covered the Stupas there. There were also a few people living there. 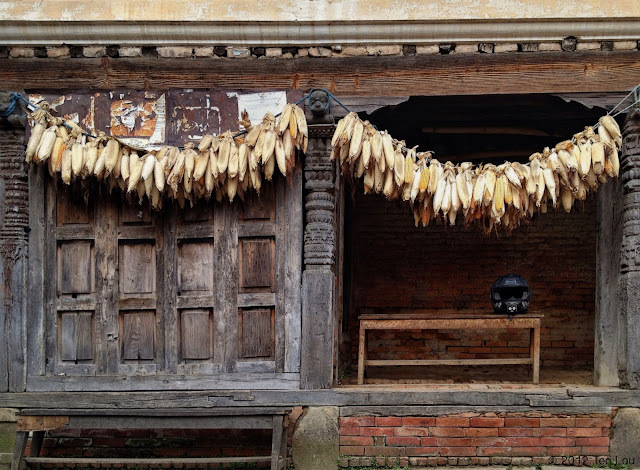 In this scene the 100 year old tradition of drying the corn cobs along the eaves is combined with evidence of the new world, a motorcycle helmet. In Nepal only the driver of the motorcycle is required to wear a helmet.